What did David Warner do to his room in Brisbane? Fair point. KP was a one-day player, pure and simple, before they put him in the test team. Ee-aye-ee-aye-oh-in Morgan was another. Talent is talent, and the better players will adapt to the role. But no, not fair point! Bloody ridiculous insanely stupid point! Where on Bob’s earth did CA get the idea that this type of player should be OPENING THE BATTING IN TESTS? The stupidity of it is not that they are brought into test cricket; it is that they are brought in as openers! There was some debate over both KP and Morgan when they were starting into the test team. Imagine how long that debate would have lasted had it been suggested that Pietersen should have opened the batting in that first Ashes test. Less than 10 seconds, that’s how long. I’m not suggesting Warner can never open in tests, but is that really the best way to bring a player of his abilities into a test team? The only explanation I can think of is that the selection committee starts every meeting watching a DVD of The Best of Matthew Hayden (with the sound off, obviously), and then sits around wistfully remembering what it was like to be 135 for 0 at lunch on the first day. It was fair dinkum great, they say, I wonder if we can get back to that. Immediately. The second only explanation I can think of is that all of Australia contains NO OPENING BATSMEN WHATSOEVER, and that therefore they might as well pick anyone. Holly Valance to open the batting for the Aussies? Why the hell not. She’s as qualified as David Warner is. It was only in the last sentence that we got some indication that you weren’t talking about Philip Hughes. I know. Two of them! Opening the batting in tests! So, just to save time on Cricinfo over the next few years, here are some cut-out-and-keep Australian test scores. Just pick one at random – that will work out approximately right. For the printer-ink conscious amongst you, those will also serve quite well to record Notts’ CC batting performances next season as well. I’ll be happy. Miserable little Judas. I saw a rather cheesy poster the other day that had a cat staring at a goldfish swimming in a bowl of water. The caption read “Self control is knowing you can, and deciding you won’t”. Unless I see one of these 20-20 batsmen play a rising ball with soft hands dropping it dead on his toes even in the presence of a close-in fielder in the Steve Waugh- Rahul Dravid mold, I will remain unconvinced that they are in the test arena for the long haul. Ooh! Can we not have any strong feelings towards Dave Warner one way or the other? I’d like that. 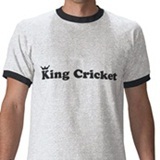 That is currently the official editorial stance here at kingcricket.co.uk. Can’t work out how to subtly warn you all about the link above, so we’ll just describe the video instead. A guy phones one of those Babestation type TV channels and tries to talk to the girl about the Ashes. It’s not explicit, but it’s not really suitable for watching at work either. It’s complex. We feel sorry for them having the misfortune to be born Australian, but we don’t feel sorry for them when they suffer as a result of being Australian – for example, were their cricket team were bowled out for 98 on Boxing Day or something like that. Warner may be a big hitter and dasher, but he works incredibly hard on improving his ‘test match’ game. He is also supremely talented, and often when you combine talent with a mountain of hard work, you get a sucessful player. Wow – this cliche fest of a post could be uttered by just about any commentator on Channel 9 (except Richie). Could be Healy, Chappelli, Slater, Taylor, Lawry – any of them!